RECENT reports indicate that Chin Peng, the erstwhile leader of the now defunct Communist Party of Malaya (CPM), is on his deathbed in Thailand. His last wish is to return home to die. Chin Peng, alias Ong Boon Hua, was an early fighter for independence against Britain. What set him apart from others of his era was his goal to turn Malaya into a full-fledged socialist state under the leadership of the Communist Party of Malaya (CPM). When the Japanese invaded Malaya in 1941, Chin Peng joined forces with his nemesis, the British, to fight the Japanese. For his efforts, he was awarded the Order of the British Empire, one of Britain’s highest decorations (it was later withdrawn). If he had stopped there, he might well have been remembered as a national hero. His political ambitions and convictions, however, drove him to launch a long and bloody campaign, first against the British and then against the government of the emerging independent state of Malaya. In 1955, at the Baling talks, the late Tunku Abdul Rahman tried to convince Chin Peng to abandon his armed struggle but he refused. An offer of general amnesty was similarly rejected. Many Malaysians of all ethnic backgrounds were killed during what came to be called the “Emergency” from 1948 to 1960. 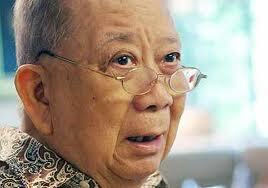 Chin Peng, like other communist revolutionaries of his time, was ruthless in the pursuit of his goals. Sound political strategy and good military tactics on the part of the Government gradually marginalised the Communist Terrorists (CTs). Like so much of our early history, the sacrifices and heroism of so many in that long struggle against the CTs lie forgotten or only selectively remembered. Commonwealth forces, for example, played a critical role but their service has never been fully acknowledged or appropriately honoured. Special Branch officers, particularly those of Chinese origin, also played a heroic role by infiltrating and undermining the CT network from within. Many paid with their lives but are largely forgotten today. The turning point came when the Alliance Government, precursor of today’s Barisan Nasional, was able to convince Malaya’s ethnic communities, especially the Chinese, that an independent and genuinely democratic nation where their rights and privileges would be protected was a better alternative to that which Chin Peng offered. As Malaya’s ethnic groups rallied to the Tunku and the Alliance, the insurrection withered. Chin Peng and his men eventually withdrew in defeat across the border into southern Thailand. Some went on to live in China. Thank goodness we were able to defeat Chin Peng and stymie his ambition to establish a communist state. God knows what our country would be like today had he succeeded. A Peoples Democratic Republic of Malaya, or something similar, would have been an unmitigated disaster. In 1989, Chin Peng was persuaded to formally bow to reality and sign a peace accord with the Government of Malaysia. The nation had moved on and both he and his dreams for a communist state had been consigned to the dustbin of history. As part of the Peace Accord, Chin Peng and former members of the CPM were to be permitted to return home and live as normal citizens. This was a key element of the accord which allowed both sides to bring final closure to the issue. Successive Malaysian administrations, however, in contravention of the solemn written undertaking enshrined in the Peace Accord, have used all sorts of excuses to block Chin Peng from returning home, even for a brief visit. It has been suggested that our ex-servicemen who fought the CTs and those who lost family members to Chin Peng’s terror might find his return unpalatable. That may be understandable but a commitment is a commitment. In any case, the Government’s position makes little sense. Many other CPM leaders, including Sham­siah Fakeh, Rashid Mydin and Abdul­lah CD have been allowed to return home or visit regularly. They were part and parcel of the CPM leadership but appear to have been absolved of their share of the responsibility for all the atrocities committed. It is disingenuous to argue, as some have, that they were treated differently because they were only puppets of Chin Peng. That is just too convenient. In addition, China which provided moral support and sanctuary for the CPM and hosted the CPM’s Radio Suara Revolusi Malaya for years, is now our close friend and one of our largest trading partners. If we could forge such close relations with the CPM’s most ardent supporter, what reason can there be to keep the now ailing ex-leader of the CPM out? Former IGP Tan Sri Rahim Noor, who signed the peace accord on behalf of the Government, has himself said that the Government should do the honourable thing and live up to its commitments under the Accord. It should do so now before its too late. Thanks to the heroic sacrifices of the security forces and the support of the people, the war against Communism was won and our freedom secured. We can afford to be magnanimous and, as a humanitarian gesture, allow an old and broken man to come home to die. Time to let bygones be bygones.